2359 vacancies are going to recruit through the SSC CHSL 2019 recruitment. Eligible candidates apply online @www.ssconline.nic.in on or before 05-04-2019. Selection for these vacancies will be held in three stages of Tier 1 objective type written test, Tier 2 descriptive type test. There is not interview for SSC CHSL 2019 Postal Assistant/Sorting Assistant Jobs recruitment. For more details regarding SSC CHSLE 2019 Postal Assistant vacancies Exam Syllabus, age limits, skill test, exam dates, exam pattern and more details are given below. 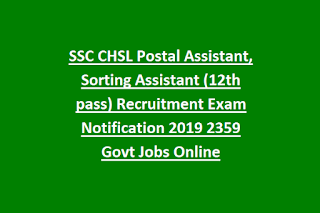 There are total 2359 vacancies available in this current recruitment of SSC CHSL 2019 Sorting Assistant/Postal Assistant Jobs. Vacancies details will be updated later. 18-27 years as on 01-August-2019. The candidate should have born in between 02-08-1992 to 01-08-2001. And age relaxations for SC/ST candidates 05 years, OBC candidates 3 years..
12th class/Intermediate/10+2 pass is mandatory to attend this CHSL 2019 Exam of SSC. Technical Education/Diploma certificates of basic computer knowledge is required. For General and OBC candidates examination fee is Rs.100/-. For women, SC/ST candidates there is no examination fee. Selection for Postal Assistant will be held in 3 different stages. Online written test will be conducted for 200 marks with the time duration of 75 minutes. Written test consists of 4 parts. For each wrong answer 0.50 negative mark will be deducted. Eligible candidate can apply online @www.ssconline.nic.in. Pay the application fee at the time of online application submission only through the Debit or credit card or through internet banking. Upload latest pass port size color photo and signature images as per given sizes. Finally submit the application form online on or before the 05-04-2019 by 05:00 pm. 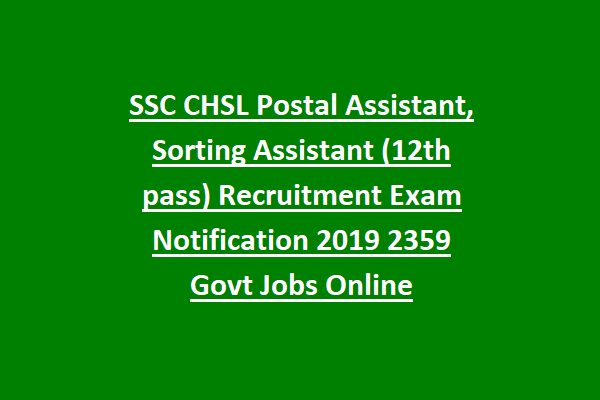 Apply Online here for SSC CHSLE 2019 Postal/Sorting Assistant Recruitment.